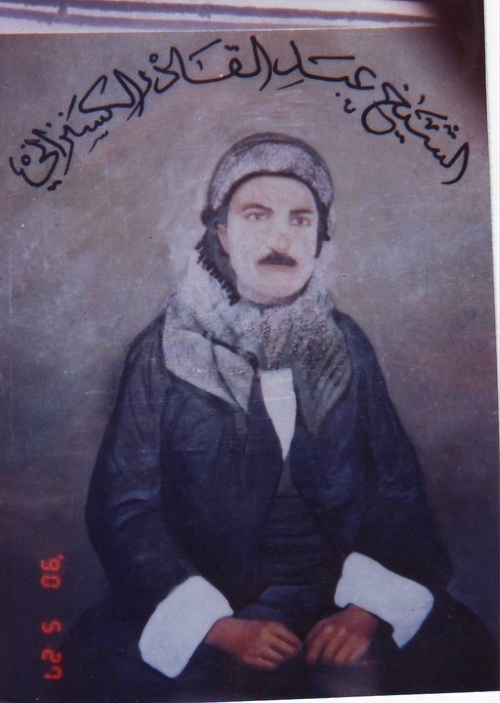 Shaikh ʿAbd al-Qādir al‑Kasnazan, who is the son of Shaikh ʿAbd al-Karīm Shāh al‑Kasnazan, was born in 1867 CE. He was among a great performer of jihad, against both his lower self and the aggressive invaders. When the British army invaded Iraq in 1917 during World War One, Shaikh ʿAbd al-Qādir declared jihad against the colonial forces. The head of the British army in Northern Iraq declared more than once that Shaikh ʿAbd al-Qādir was a serious barrier to the advance of the invading army. After the British army took control of northern Iraq, an army of 1,000 soldiers was sent to camp near Kirpchina to be ready for the order to attack the village. Shaikh ʿAbd al-Qādir instructed his son Shaikh Ḥussein to lead a group of dervishes and attack the British army. The battle resulted in the total devastation of the invaders and the capture of the officers and soldiers who survived the battle. This humiliating defeat enraged the British authorities who sent an army of 20,000 soldiers and local mercenaries who surrounded Kirpchina and burned it down. By God’s protection, Shaikh ʿAbd al-Qādir and his family had already left for the mountains. In circumstances similar to the emigration of his grandfather Prophet Muhammad (PBUH), Shaikh ʿAbd al-Qādir then left under the darkness of the night to Iran. He taught people the manners of the Prophet (PBUH) and renewed the light of Islam. The Shaikh was known for his patience, generosity, and care for the orphans, obeying the divine commandment: “ِAs for the orphan, do not oppress” (93.9). He remained in Iran and continued his mission of serving Islam until he left this world. Shaikh ʿAbd al-Qādir al‑Kasnazan was an exceptional example in his practice of waraʿ (pious restraint). When he emigrated to Iran he resided in a village that had been usurped from its people by a feudal landlord. During his stay there, Shaikh ʿAbd al-Qādir never used anything from that village. He refrained even from using water for drinking or other needs because he saw it as stolen property. Instead, he used melted water. He considered the water of the village prohibited because it no longer belonged to its rightful owners. Shaikh ʿAbd al-Qādir remained in Iran until his departure from this world in 1921 CE. He is, therefore, known as “ash‑Shaikh al‑Muhājir (the emigrant Shaikh)”. Shaikh ʿAbd al-Qādir appointed his son Shaikh Ḥussein al‑Kasnazan as his successor. Due to the desire of the dervishes, the tomb of the emigrant Shaikh was returned to Iraq to be re-buried in the village of Kirpchina.